Phish are known for being one of the best live acts on the planet. Since its formation, the band has had a reputation for playing harder, tighter and just plain better than other bands. So when you’ve been doing that for nearly 30 years, what do you do to make a show special? How do you top yourself? Perhaps this was the thinking behind inviting Kenny Rogers on stage to sing “The Gambler” with them. And while Rogers is no Springsteen (who sat in with the group in 2009), I can’t help but assume that’s the defining moment that this set will be known for. But even apart from that, this set was in almost every way better than the last two shows Phish played at Bonnaroo. The songs were tighter, the jams were more focused, and the setlist was great. From Mike Gordon’s funky bass playing on “The Moma Dance,” right down to fans singing along with keyboardist Page McConnell on The Velvet Underground’s “Rock and Roll,” the showed oozed energy. As much as people complain about Phish fans, they easily drew the most peaceful and respectful headliner crowd of the weekend. Which isn’t to say that the fans weren’t into it. It just seems like everyone who was interested in being rowdy and talking loudly over the music didn’t want to stick around and see Phish (what a surprise). 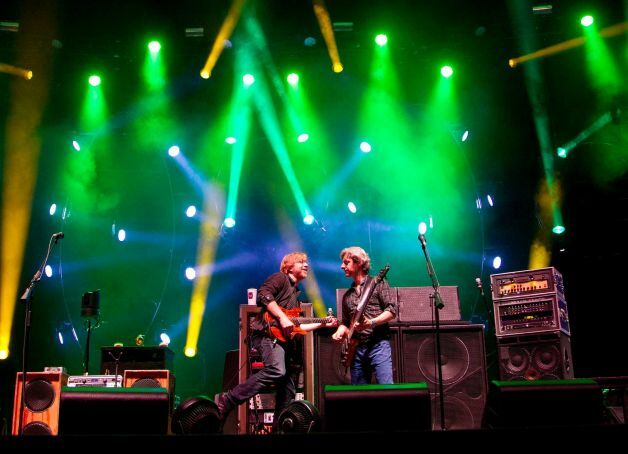 Phish festivals provided much of the inspiration for Bonnaroo and even though this marked only the second time the band has played the festival, it felt like a homecoming. And even though as soon as the set ended everyone had to go back to camp and pack up their stuff and go back to real life, that seemed like the last thing on everyone’s mind as fireworks exploded in the sky behind the band during the end of “Tweezer Reprise.” Now Bonnaroo is in the same position Phish finds themselves in every night. How are they going to top that?